The birth certificate and the certificate on marital status need to be in Croatian language and need to bear Apostille stamps on them. The Ministry of Foreign Affairs of Croatia issues Apostille at the office next to St. Peter's Church (Petrova Crkva), which is located on Vlaška street. 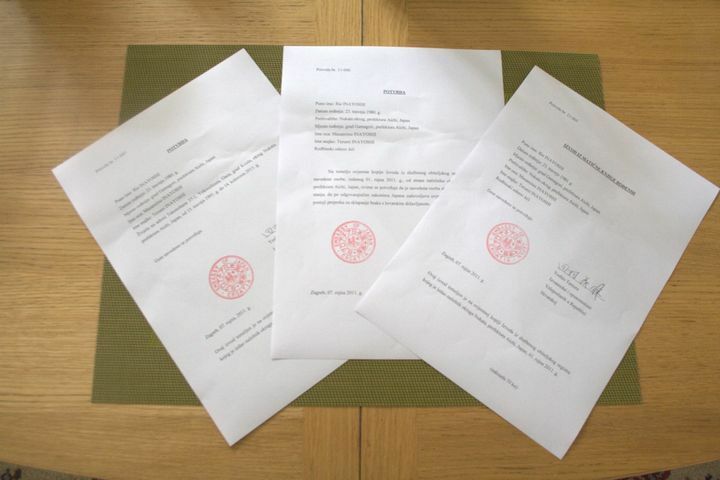 Issuing an Apostille costed 60Kn per document in September 2011. And the fee needs to be paid to the bank account of the ministry and cannot be paid directly at the office. So, when you visit the office to get an Apostille, consider time in queueing in a bank, too! Also, when I visited there to get the Apostille stamps, their working time is from 9:00 to 11:00 and 13:00 to 15:00. If you choose a non-Croatian citizen as your witness (svjedok/svjedoci) for your wedding, you need to file a copy of his/her passport. When you file those necessary documents at your local Matični Ured (a registration office), your Croatian partner will be required to show his/her ID card. Also, you might be required to file a copy of your non-Croatian partner's passport. For Japanese, the Japanese Embassy in Croatia creates the birth certificate and the certificate of the marital status in Croatian language with cost of 70kn per document. If you are Japanese and intend to obtain those documents, bring a copy of family register of yours, which is required upon preparation of the documents. In my case, I asked the Japanese Embassy to prepare 2 copies of the birth certificates, the certificate of the marital status and a criminal record with the Apostille stamp. You need to file another birth certificate when you file a requirement for the temporary residence permit, so I asked another copy of my birth certificate for that. The criminal record is also required to file for the temporary residence permit. I was told that it took about a month to obtain the criminal record because the record is created in Japan and send back to the Embassy from Japan, so better to request the preparation of the criminal record together with other documents. Apart from the criminal record, all the documents will be prepared by the following day after you request. Croatian people were very surprised about the speed the Japanese Embassy prepares documents and even in Croatian language.